The One Hundred Sixth United States Congress was a meeting of the legislative branch of the United States federal government, composed of the United States Senate and the United States House of Representatives. It met in Washington, DC from January 3, 1999, to January 3, 2001, during the last two years of Bill Clinton's presidency. The apportionment of seats in the House of Representatives was based on the Twenty-first Census of the United States in 1990. Both chambers had a Republican majority. March 29, 1999: Dow Jones Industrial Average ended above 10,000 for the first time. Membership changed with two deaths. There were two resignations and three deaths. In this Congress, Class 1 meant their term ended with this Congress, facing re-election in 2000; Class 2 meant their term began in the last Congress, facing re-election in 2002; and Class 1 meant their term began in this Congress, facing re-election in 2004.
, for members (House and Senate) of the committees and their assignments, go into the Official Congressional Directory at the bottom of the article and click on the link (1 link), in the directory after the pages of terms of service, you will see the committees of the Senate, House (Standing with Subcommittees, Select and Special) and Joint and after the committee pages, you will see the House/Senate committee assignments in the directory, on the committees section of the House and Senate in the Official Congressional Directory, the committee's members on the first row on the left side shows the chairman of the committee and on the right side shows the ranking member of the committee. ^ a b In Rhode Island, John Chafee (R) died October 24, 1999 and his son, Lincoln Chafee (R), was appointed November 2, 1999 to finish the term. ^ a b In Georgia, Paul Coverdell (D) died July 18, 2000 and Zell Miller (D) was appointed July 25, to continue the term. 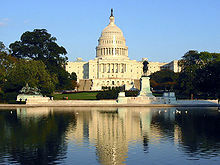 "Videos of House of Representatives Sessions for the 106th Congress from www.C-SPAN.org". "Videos of Senate Sessions for the 106th Congress from www.C-SPAN.org". "Videos of Committees from the House and Senate for the 106th Congress from www.C-SPAN.org". House of Representatives Session Calendar for the 106th Congress (PDF). Senate Session Calendar for the 106th Congress (PDF). Congressional Pictorial Directory for the 106th Congress. Official Congressional Directory for the 106th Congress. Official Congressional Directory for the 106th Congress (1st Revision) (PDF). Official Congressional Directory for the 106th Congress (2nd Revision) (PDF).